So, David is 3. Actually he is 3 + 3weeks b/c mommy hasn't gotten herself up to posting his birthday pics. 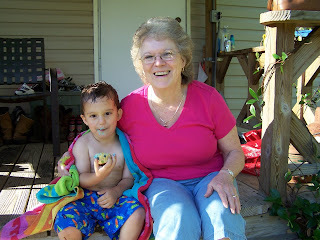 We had a great time however, both of his "Pappoos" were there and Grammy B and Grandma. It was such a blessing to have his grandparents from California come all the way out for his birthday. Now, everytime he sees a plane he waves and says hi, like they are on that plane. We decided to keep things low key, b/c that's how David prefers it and enjoyed grilling burgers and hotdogs in the backyard. Our close friends and neighbors, the Caligures came over and blessed us with wonderful potato salad and TWO apple pies. The boys really have a ball with their kids, there are 6 of them with their ages ranging from 6mths-11yrs. 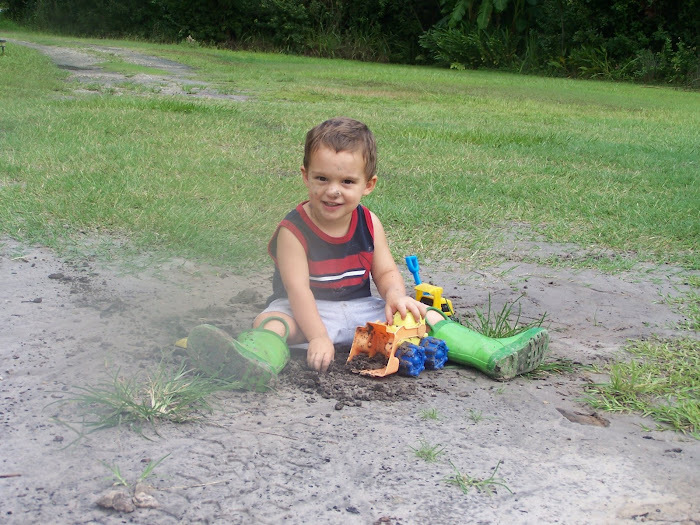 It is a lot of fun watching them interact and play with others, David seems like such a big boy showing the little ones how his dump trucks work and chasing them in the sprinkler. 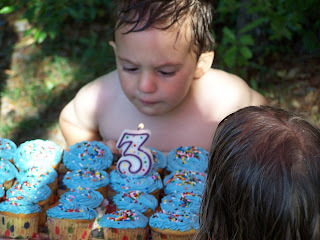 He wasn't very cooperative with blowing out his candles and diving into his cupcakes, though. He really doesn't enjoy the "all eyes are on you" scenario that comes with the birthday festivity. 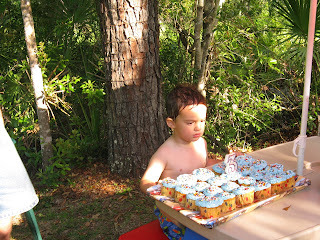 I had to laugh b/c later, once no one was paying attention, he decided he wanted a cupcake and then proceeded to eat 3. I felt a little guilty allowing him to overeat like that but I figured 'why not, it's his birthday', let him go all out. 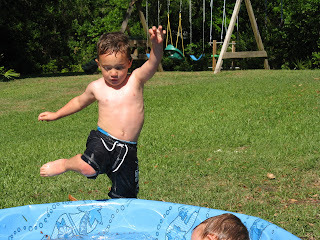 The sun got very hot after awhile so the kids ran around in the sprinkler, laughing and having a ball. It brought back memories of when I was a kid b/c we didn't have a pool like some of my friends and that was how we cooled ourselves off back then. Good old fashioned fun. We didn't get him a lot of gifts, but it ended up taking us 3 days for him to open them b/c we were so busy. I think he thought his birthday would go on forever and he seemed like he enjoyed receiving his cards ( his own mail) just as much. Esp. Uncle Mark's b/c when he opened it, it makes sounds like a firetruck with a great pic on the front. 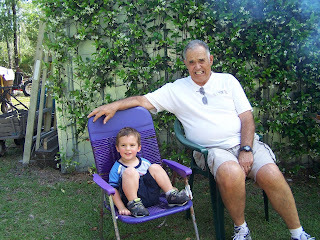 One of his favorite gifts was from Grammy and Pappoo Borges, who bought him a red semi truck. It is definitely not size that does it for him, b/c apparently he bypassed all the big trucks and kept his decision forthe modest one. The red one......that boy sure does love red. All and all it was a great celebration. I was exhausted with this little one growing inside me and the commotion of it all but the memories were priceless. My little boy is starting to get away from me. I still remember holding him in my arms like it was yesterday. Sometimes I try and he wiggles and giggles to get out of my hold, like he's too big to be cuddled. I am learning ways to get to his sensitive side, though he likes his back scratched before he falls asleep and when I love on Daniel, he comes to me asking for his lovin' . I know that's kind of cruel but a mommy will go to any measure to get kisses from her son. I am trying everyday to stop and breath in the sweet fragrance of motherhood. David and Daniel are a daily reminder of God's love for me and how he wants to bless me more and more......only if I'd take the time to take in all in. Soo glad that you got to enjoy this time. Hope you are starting to feel better. Miss you, friend. We've got busy weeks coming up but hope to talk to you soon. Thanks for sharing the pics. Looks like fun! Sometimes the small parties are more fun. I can't believe how big both the boys are getting and soon the new one (she?) will be here. Hope all goes well this weekend with Jake, Brian, and the boys! Sounds like a lot of fun! They are growing up so fast!